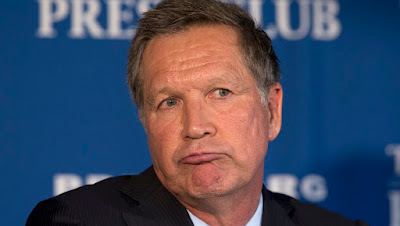 John Kasich it seems, does not want to win the Republican nomination. I'm sure he's gone a long way to win the establishment vote, with his recent comments on immigration but that's not gonna help him win anything. Self-disqualify though? Ya. So let's just skip over that oath of office where you swear to protect and defend the Constitution, John. Let's just be selective about which laws we choose to enforce. Does that approach sound familiar to conservatives? Ya. And we don't like it. Way to hand an Ohio surge to Trump. But he's not done, as the article points out. Kasich made no mention of the fact that 87 percent of illegal immigrant households with children in 2012 were on welfare, according to a 2015 report based on Census Bureau data. And what about the hard working families who were here already? What about the families that struggled and waited to come to America legally? Do they just count for squat? Do their job prospects not matter? Apparently.